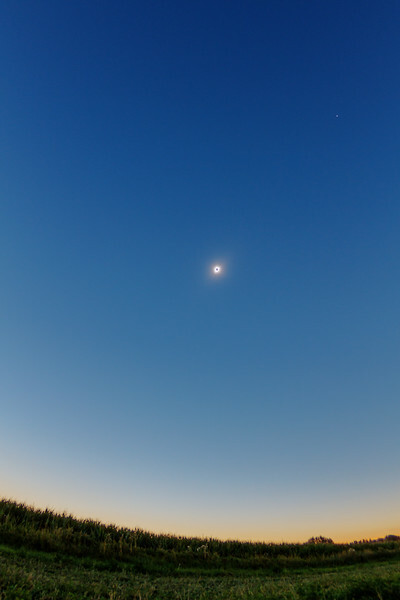 Photos of the August 21, 2017 solar eclipse taken near Mud Lake, Idaho. One minute after first contact. 20 minutes after first contact. 30 minutes after first contact. 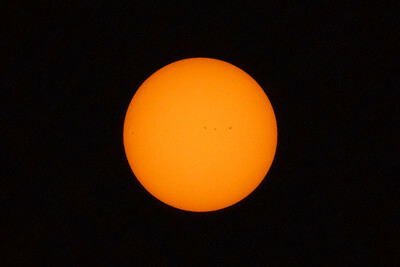 Sunspots getting covered. 55 minutes after first contact. 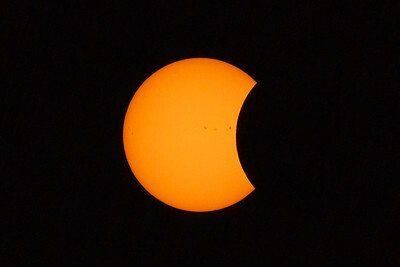 7 minutes before second contact. 71 seconds before second contact. After this photo was taken, I removed the solar filters to prepare for totality! A screen grab from my iPhone, taken one minute before second contact. The view is looking west toward the mountains, which are still completely hidden by the haze. The haze is white because it's still being lit up by the sunlight. 6 seconds before second contact. 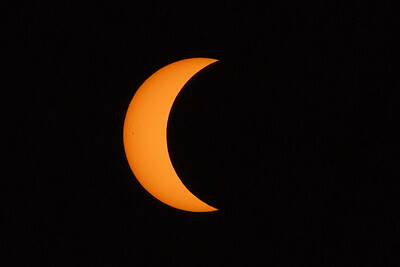 Solar filters are off. The start of the Diamond Ring! Note the prominence at the far right. The moon has just uncovered it. Roughly four seconds before second contact. 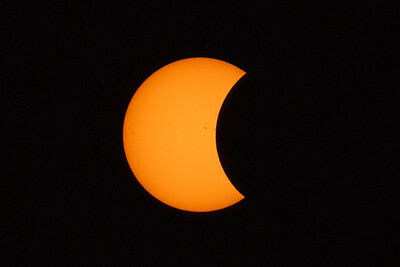 The "haze" is now in the moon's shadow and so is not being lit up anymore, making the outline of mountains visible - even though they are in the shadow too! 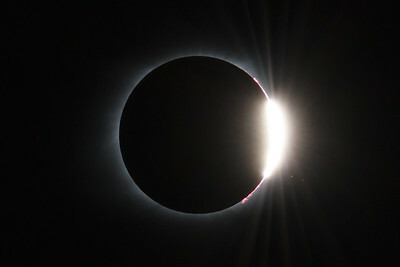 The Diamond Ring, three seconds before second contact. 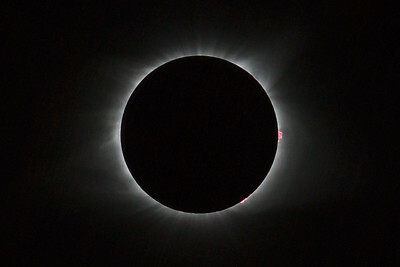 A short (1/2500 sec) exposure taken 4 seconds after second contact showing the inner corona and some prominences. 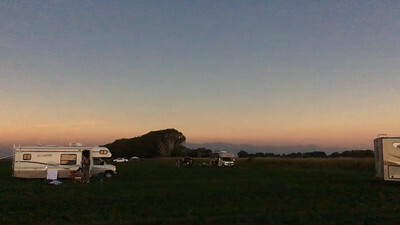 The view looking west, 10 seconds into totality. The view to the east - over the cornfield! - taken 12 seconds into totality. 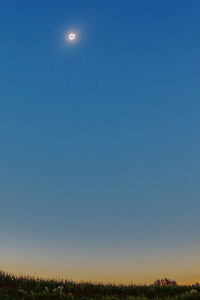 Venus is to the upper right of the sun and moon. Another view to the east, 24 seconds into totality. 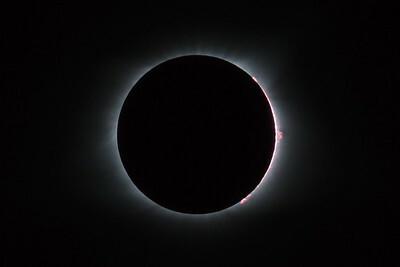 The inner/middle corona and some prominences, 27 seconds after second contact. 68 seconds after second contact. Note how much more of the big prominence at the far right is now visible. A slightly longer exposure, taken 1 second after #17, showing more of the middle corona. This image is a composite of four images taken roughly 74 seconds into totality, so just after the middle of the eclipse. 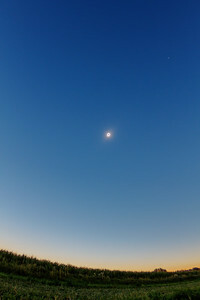 The four images were taken with exposures ranging from 1/320 to 0.8 seconds. 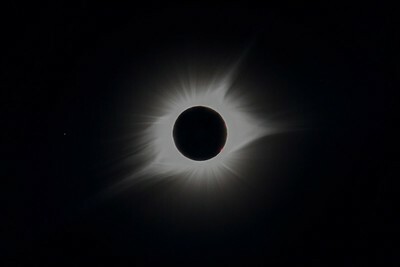 The images were processed using a combination of Photoshop and Photomatix Pro to bring out more of the detail in the middle and outer corona. 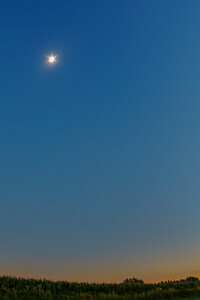 The bright spot to the left of the sun and moon is the star Regulus. 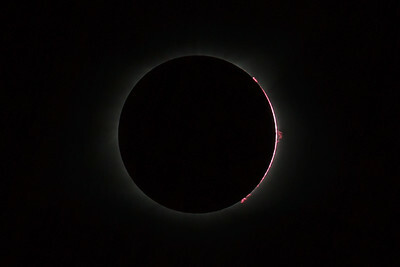 Another short exposure (this one at 1/1250 sec) showing detail of the even-more-uncovered prominences at the right. Same exposure as for photo #20, this one taken 109 seconds into totality - and only about 26 seconds from third contact. 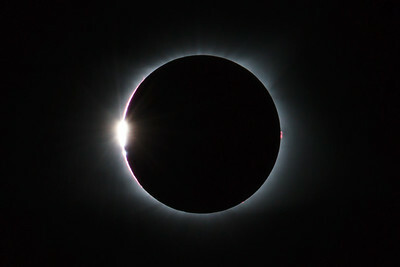 2 seconds before the end of totality. 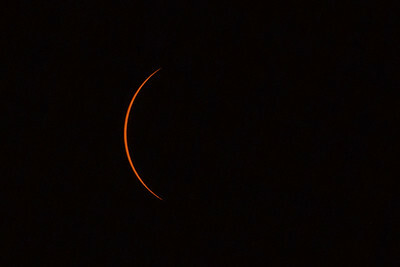 Another short (1/1250 sec) exposure taken one second before the end of totality. Third contact! 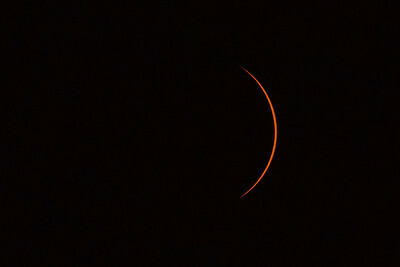 A very short exposure (1/2500 sec). The view to the east, 3 seconds after the end of totality. 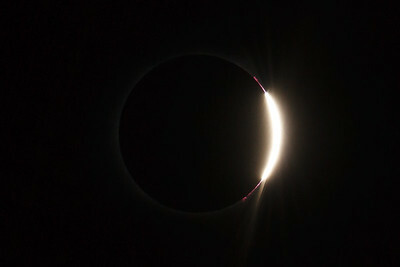 The second Diamond Ring! 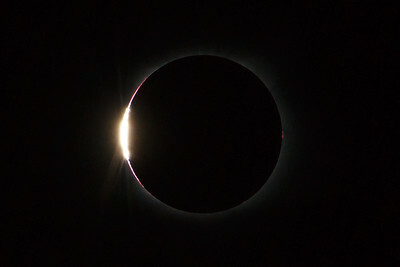 The second Diamond Ring, 7 seconds after third contact. I think the white dot to the right of the diamond may have been a bird. 10 seconds after third contact. Two birds to the lower right of the diamond?! 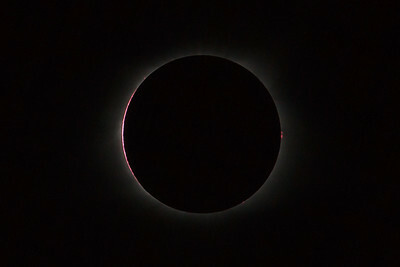 This extremely short exposure (1/8000 sec), taken 15 seconds after third contact, was the last one I took before putting the solar filters back on. 65 seconds after third contact. 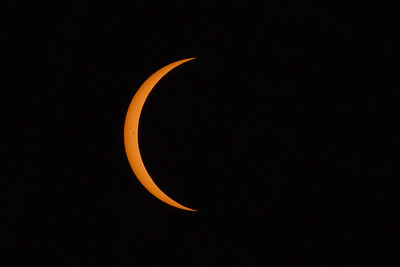 Solar filters back on.